Once again we were lucky enough to get a day when the weather was reasonably good only after we had finished the game did it rain for about 20 minutes but by that time we all were under the pavilions enjoying the drinks. 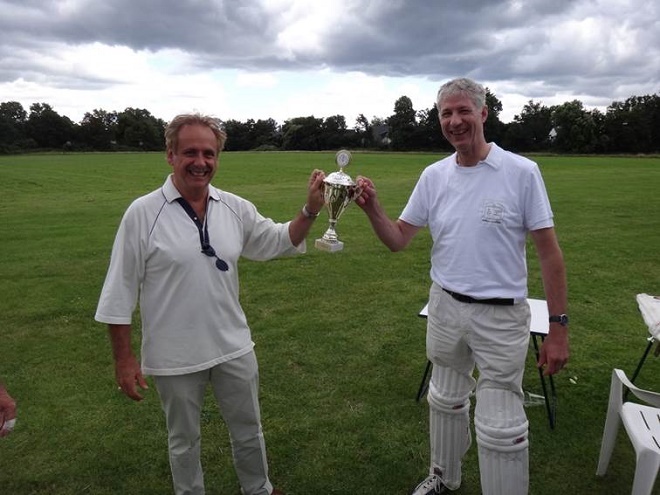 The BBCD went into bat first but unfortunately the Church bowlers gave them a hard time and despite the fact that the BBCD used all of its 20 overs it was only for a disappointing score of 55 runs. At half time the Ladies who had been working flat out on the sandwiches and to whom we give our sincere thanks for their help finished just in time. 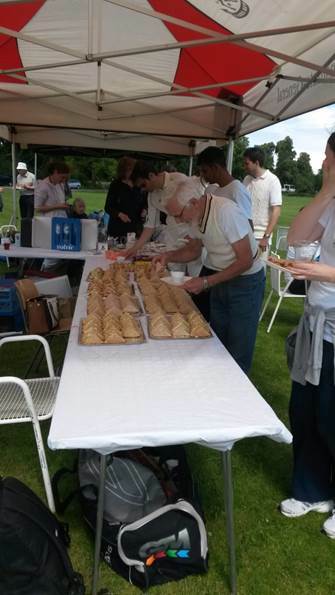 The sandwiches were a special treat this year as they included not only the old favourites of salmon & cucumber and egg & cress but also BLT (bacon, lettuce, tomato). This seemed to go down well and will probably be repeated next year. As a special treat this year the committee decided to sponsor the Pimms and beer so all the drinks were absolutely free of charge. The decision to do this went down well with all those who attended. After the break the Christ Church players got in some good batting and overtook the BBCD score with 5 clear overs to spare. After the match finished we retired to the Church grounds where we had an excellent barbeque cooked by our Chairman Andrew. Apart from the usual Bratwurst and pork steaks we also had beef burgers and spare ribs. This was a lovely day out and everybody seemed to enjoy themselves very much. Our thanks go to all those who helped and particularly to Alan who put in so much work behind the scenes. We look forward to many more Cricket matches in the years to come.